- to develop an opportunity for involving SMEs in the activities of SEAFOODplus, and to run adequate demonstration projects originating from research results obtained. In the first 18 months period a demonstration plan was established involving a SEAFOODplus demonstration team. A demonstration policy was formulated, making it possible to select the best demonstration projects to exploit the research results obtained. Formal contacts has been established to public authorities on a national and regional basis. The establishment of a good platform and a network structure of facilitators and public authorities was performed during the first 18 months period, which now constitutes an excellent opportunity for developing demonstration projects and the involvement of SMEs. A demonstration plan has been formulated, proposing SEAFOODplus funds as seed money for mobilising regional and national funds for co financing SME development. As a result of the first internal call two projects were selected as demonstration projects, and an external call were launched in May 2006 for attracting the interest of industries to participate in the demonstration activities. The projects have now been started successfully. A second internal call in 2007 resulted in a new external called announced on this page. The call was closed on 20 November 2007 and the responses from interesting industries are now being processed before projects can be started. 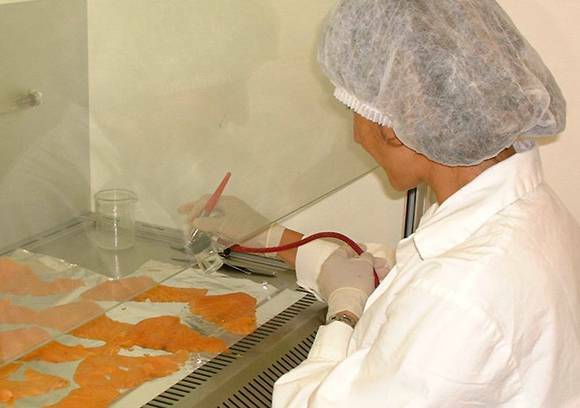 The main objective of this demonstration project is to evaluate and demonstrate the antioxidative effect of plant extracts enriched in caffeic acid in frozen fish. The project also includes extraction, purification and analysis of a natural phenolic extract enriched in caffeic acid aimed to be used as food additive. - To demonstrate that the developed TraceShell standard can be integrated with a specific IT system to facilitate the traceability in the shellfish area. - To demonstrate in at least four European countries that this system can be used for tracking and tracing mussels and will be an advantage for the shellfish sector in Europe. - To speed up the introduction process of the TraceShell standard in the sector. - The objective of this project is to prove that the inclusion of wheat dietary fibre, together with other commercial dietary fibres leads to sensory acceptable restructured products made of fish muscle, that fulfil the requirement of ‘source of dietary fibre’ and/or ‘high content of fibre’, according to the EC legislation. The demonstration would aim at the optimization of the formulation, scaling up, and a limited consumer test (product testing). The participating companies have a maximum of 8 months commitment within the demonstration project and collaborate in co-funding with own or external funds.